Summertime and the living’s easy! To me, summer is all about having fun… and effortlessly stunning skin! I love a flawless finish makeup application, but who wants to spend a million years getting ready? Not this girl! With L.A. Colors amazing multitasking face makeup products, you can get serious professional coverage in a matter of minutes! I’m OBSESSED with the L.A. Colors Cover Up Pro Concealer Sticks! These sticks are absolute skin savers. 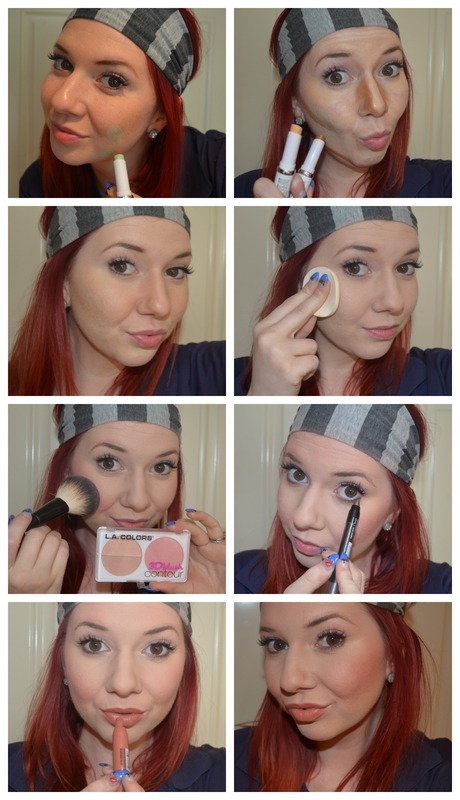 Contour, correct, and cover – all with the same product! This product applies smoothly, blends effortless, and provides the perfect amount of coverage without being too heavy. Start off by concealing any imperfections. Remember our friend the color wheel? I neutralized my red blemishes using the Cover Up Pro Concealer Stick in Mint (green and red are complementary colors that cancel each other out). I applied Cover Up Pro Concealer Stick in Glow under my eyes, down the bridge of my nose, on my upper cheekbones, my smile lines, and in the depression in my chin to highlight. I then swiped Cover Up Pro Concealer Stick in Café under my cheekbones, jawline, and along the sides of my nose and blended in to sculpt my features. Quickest contour ever. To set my sculpted skin, I patted on L.A. Colors Mineral Pressed Powder in Fair. To add even more summer color, I dusted on 3D Blush Contour in My Sweetie to the areas where the sun would hit my face. When your skin is the star of your look, you can go minimal with the rest of your makeup. Just a swipe of liner (I used Jumbo Eye Pencil in Sand Castles) under the eyes and a touch of gloss on the lips (I used Chunky Lip Pencil in Crème Brulee) and you’re good to go!